After traveling over 1,100km on the final 2 days, we are home. For some, coming home was exciting. For others, it has come with mixed emotions; parting with a group of people who have become our family and seen our true heart. Filled with anticipation and perhaps a bit of anxiety – will people understand the profound impact this journey has had on me? The way it has shaped and changed me? Built my understanding of myself and shifted my perspective? Changed the way I see and love my Aboriginal brothers and sisters? Will I be able to stay true to the promises I’ve made? Our team are filled with hope. As we return home with young people who have undoubtedly been changed; in awe of these future leaders, ready to put into practice what they have seen, felt and learnt. 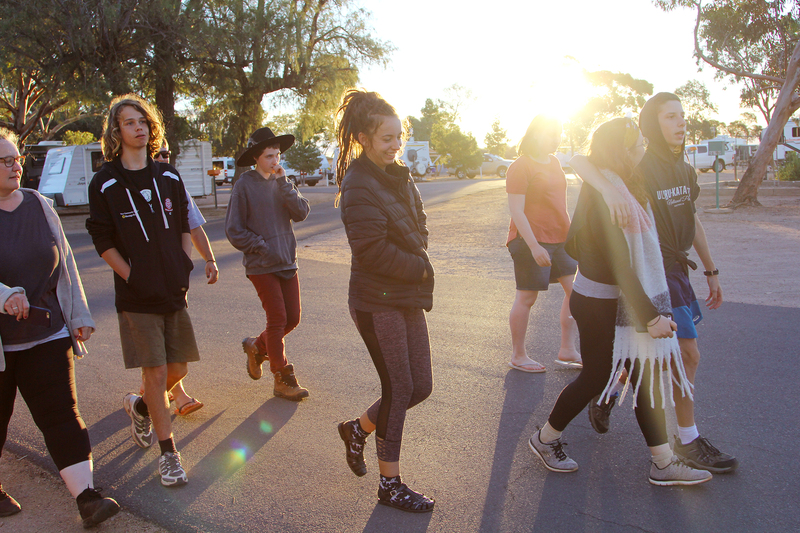 On the final day of the pilgrimage, these young people shared with us how they want to live differently. We spent some time considering our experiences, the new knowledge we have gained and the people we have met and wrote a personal ‘Acknowledgment of Country’. We all understand the importance of this now and it has become personal. Taking the time to stop and think about our fellow Pilgrims and encouraging one another was deeply moving. Together with our new Aboriginal friends we have become family. All gaining new brothers and sisters. Friends to hold onto as we work towards a better future. We return home grateful and look to the future with hope.